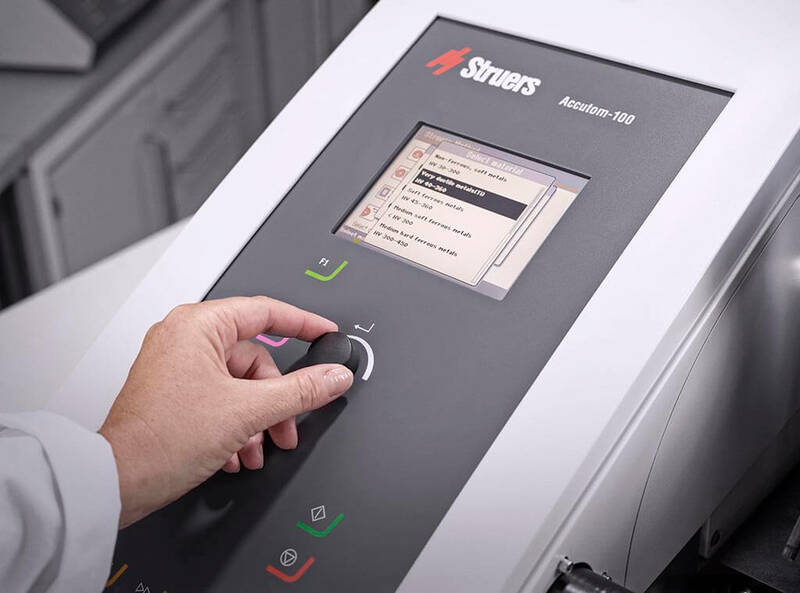 The redesigned Accutom cut-off machines from Struers are optimized for precision and ease of use to give the user a head start in the drive for perfect specimens. 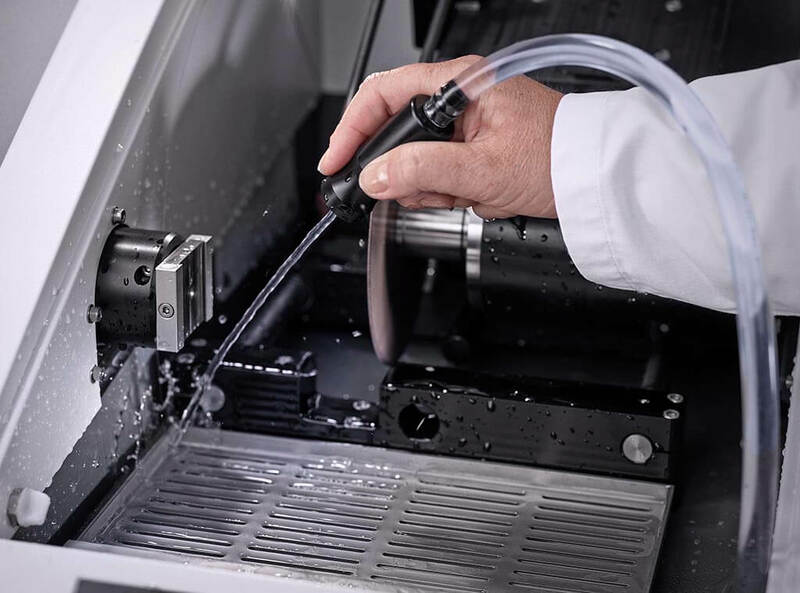 Packed with easy-to-use functions, they enable world-class cutting precision with a minimum of effort. The Accutom-100 includes a MultiCut function for extra productivity, and a grinding mode with multiple bi-directional sweeps between steps to ensure perfect planeness. Positioning with fingertip precision is easy. The operating keys on the control panel move the specimen holder in the X-direction with 5 or 100 μm increments, and the cut-off/cup wheel motor in the Y-direction. 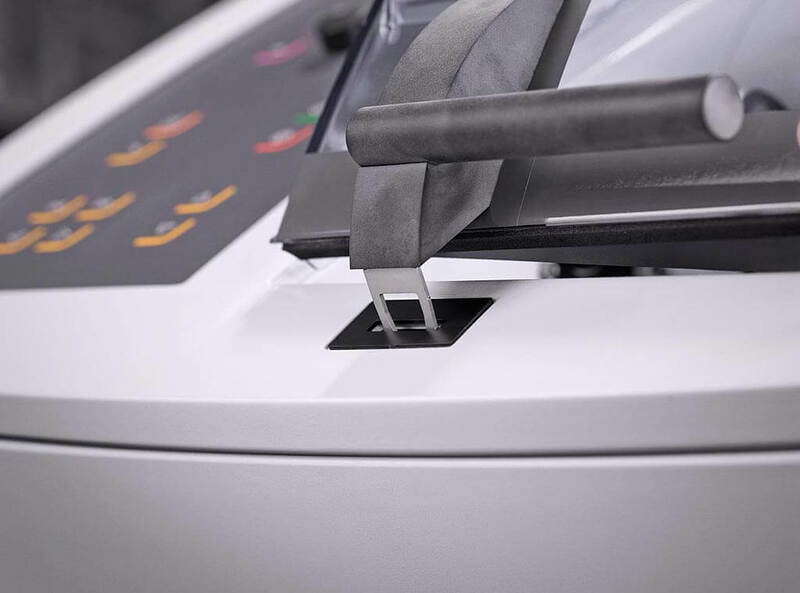 Mounting the specimen holder directly on the X-movement arm ensures a high level of precision and parallelism. An intuitive user interface provides a clear overview of each method and related cut-off wheels. A smart turn/push knob enables fast selection of settings and large icons provide an easy-to-understand overview of functions. 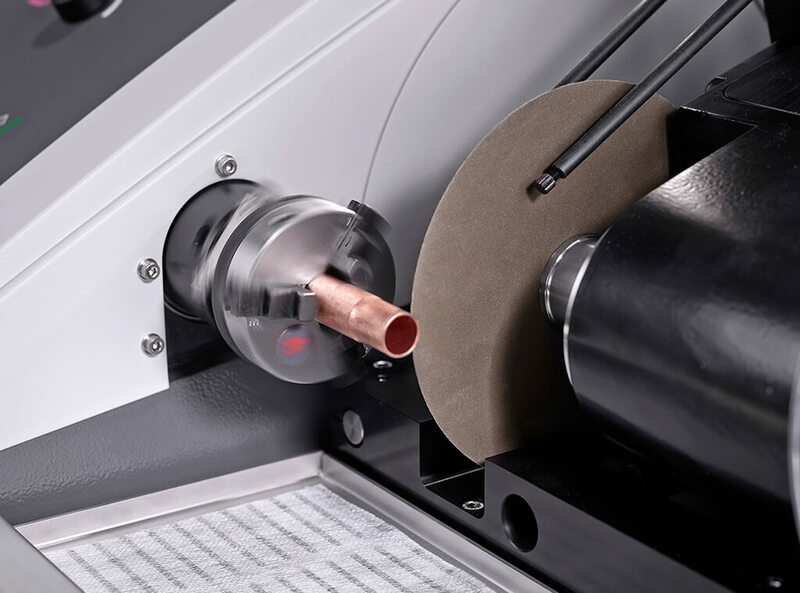 Grinding mode is available on Accutom-100 and can be used for all types of material using multiple bi-directional sweeps between movements in the X-direction to ensure perfect planeness. Two grinding modes are available for accurate control of material removal to achieve the optimum preparation result. 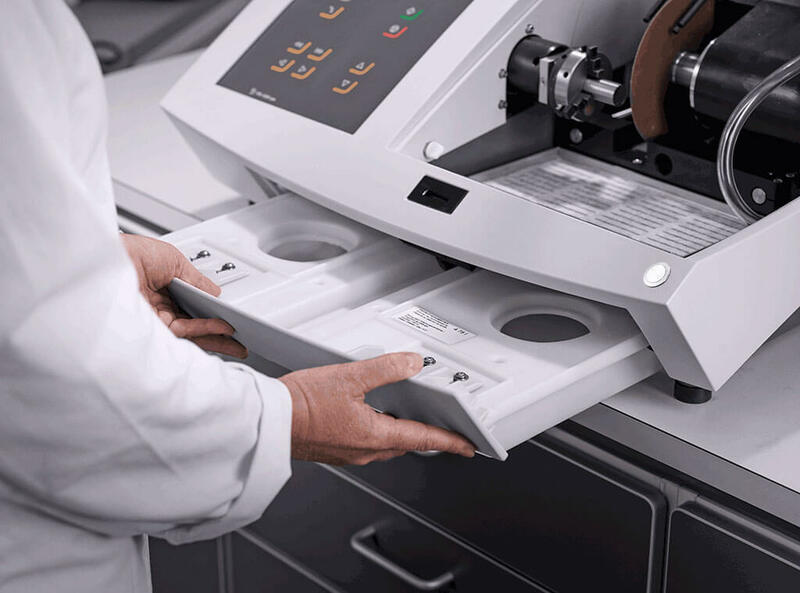 World-class precision makes Accutom ideal for delicate applications such as teeth, otolith, microelectronic components, PCB, painted layers, minerals and concrete. 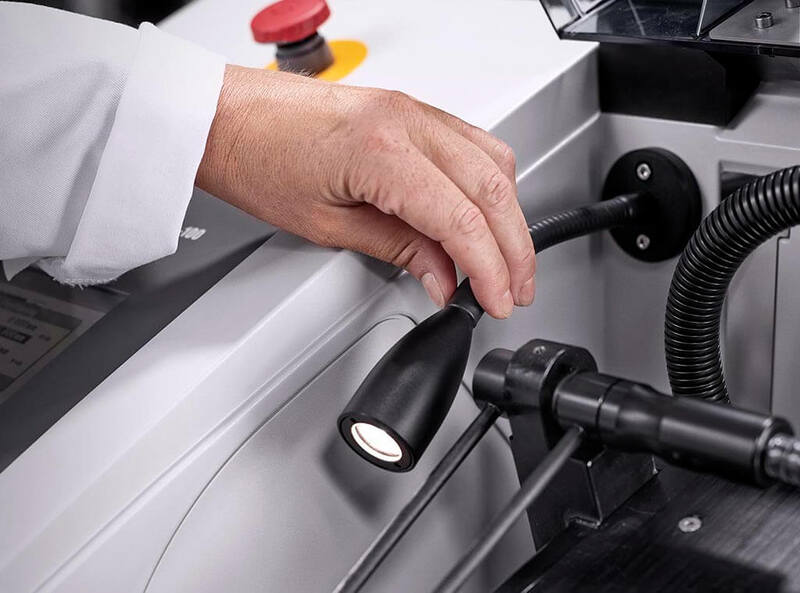 Positioning with fingertip precision is achieved using the convenient smart keys on the control panel to move the specimen holder in the X-direction with 5 or 100 µm increments and the cut-off/cup wheel motor in the Y-direction. An intuitive user interface provides a clear overview of each method and related cut-off wheels. A smart multifunction knob enables fast selection of settings and large icons provide an easy-to-understand overview of functions. 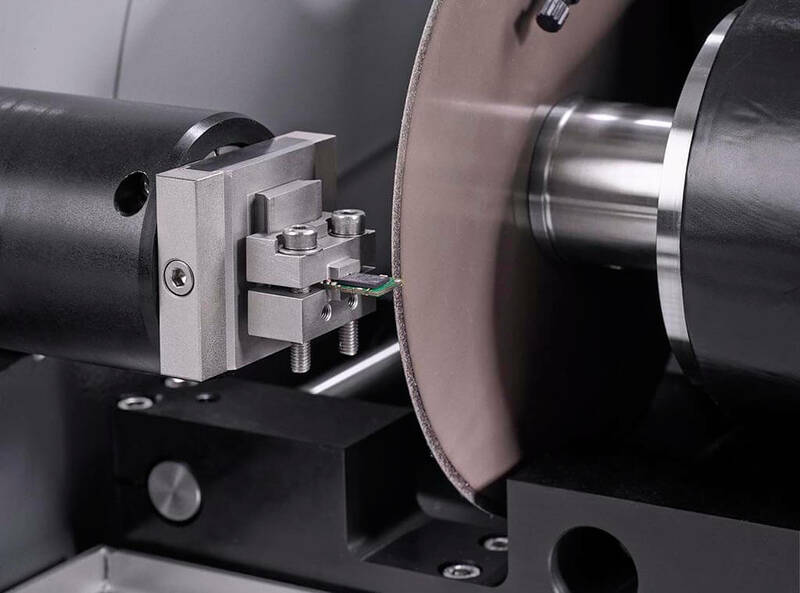 Available in Accutom-100, grinding mode can be used for all types of material using multiple bi-directional sweeps between movements in the X-direction to ensure perfect planeness. Rotation of the workpiece significantly reduces cutting time, e.g. for a tube or round workpiece, while oscillation prevents overheating when cutting hard materials. The MultiCut mode boosts productivity by enabling cutting of up to 10 identical or different slices in a single, automatic workflow. 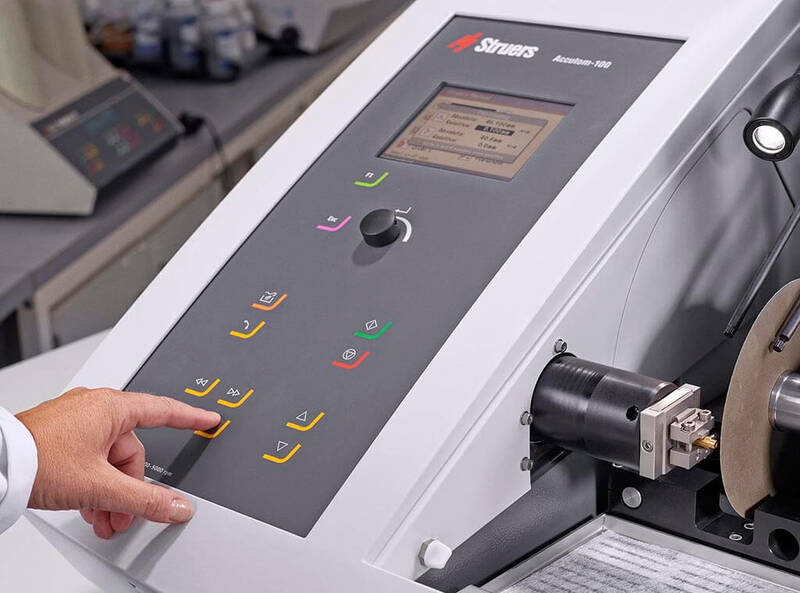 MultiCut is available on the Accutom-100. Complies with the latest safety standards to ensure optimal safety for the operator. Provides easy illumination of alignment and the machine interior when flushing. 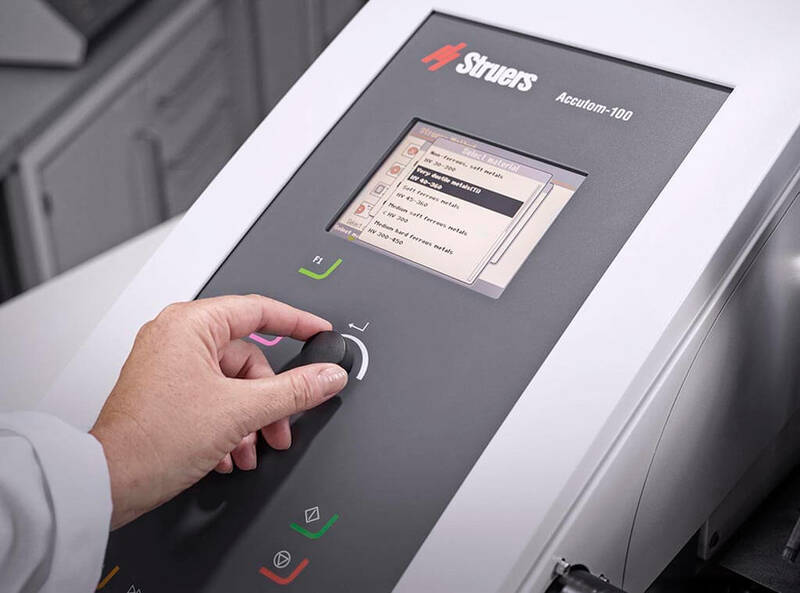 Enables input and retrieval of up to 100 cutting and grinding methods. Makes cleaning fast, easy and effective. Reduces cutting time and avoids overheating of hard materials. No extra tank required – capacity of 4.75 l.
Accutom is available in two variations. See specifications for details. Precision cut-off machine with variable speed (300 - 3000 rpm). Variable automatic feed speed and motorized positioning system with digital read-out. Built-in specimen holder rotation and oscillation. Three changeable cutting methods. Complete with recirculation cooling unit, flange set 50 mm dia. and tray for extra filter paper and collection of cut specimens. Specimen holders, cut-off wheels and additive for cooling fluid are ordered separately. Precision cut-off and grinding machine with variable speed (300 - 5000 rpm). Variable automatic feed speed and motorized positioning system with digital readout with MultiCut function. Built-in specimen holder rotation and oscillation and vacuum pump connection for vacuum chuck. Cut-off wheel, cup wheel and material database and 100 optional changeable methods included. Complete with recirculation cooling unit, flange set 50 mm dia. and tray for extra filter paper and collection of cut specimens. Specimen holders, cut-off wheels, cup wheels and additive for cooling fluid are ordered separately.